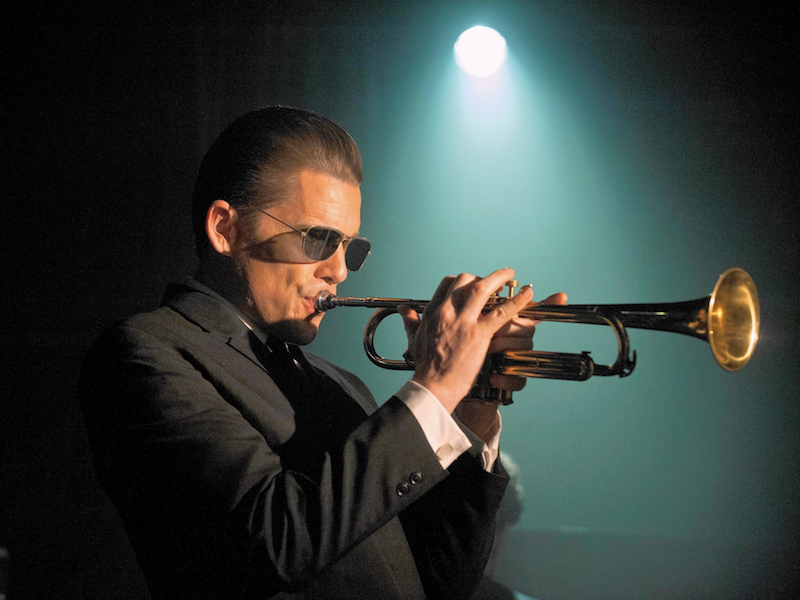 The life and career of jazz trumpet legend Chet Baker was characterized by the kind of sublime highs and devastating lows that made an eventual movie about his story almost an inevitability. However, in the willfully unconventional music biopic Born To Be Blue, director Robert Budreau encapsulates these highlights and lowlights into a single redemptive arc that’s meant to exemplify the spirit of his subject rather that rattle off each detail of his life. Like last year’s superb Love & Mercy, it taps into the musician’s impulse of to create (and destroy) but also accepts the aspects of artists that are, to some degree, unknowable. The story is told primarily from 1966, where Baker (Ethan Hawke) is cast as himself in a movie about his earlier years in jazz and an up-and-coming actress Jane Azuka (Carmen Ejogo) is cast as his romantic interest. Baker and Azuka begin seeing each other off-screen as well but at the end of their first date, an assault in a parking lot leaves Baker badly beaten and without the use of his front teeth. This setback forces Baker to effectively re-learn how to play his instrument and the film chronicles his slow recovery and hopeful return to the jazz limelight. Baker’s longtime addiction to heroin is also a critical element examined in the film but rather than explain away the nature of his dependency, Budreau takes a refreshingly ambiguous stance on the role that drugs played in Baker’s life. In this genre, it can be commonplace for directors to chastise their subjects for their drug use but he instead embraces it as crucial piece of Baker’s being. A transfixing early shot of a tarantula crawling out of the bell of a trumpet serves as a haunting metaphor for Baker’s inner pain but the psychology behind his decision-making isn’t made as blatant as it could have been. Hawke gives a similarly enigmatic and yet somehow also charismatic performance in a role that beautifully captures the wounded spirit of a perpetually driven artist. He gives us the sense that even Baker may not know why he wants what he wants but his unwavering determination to his craft is enough for us to root for him to reach his goal, no matter how elusive it may seem to be. Ejogo is also terrific not only as a woman who is Baker’s main source of support but also as a determined young actress with her own drive and career ambitions to consider. The film’s faults come largely from Budreau’s tendency to let the story get in the way of these performances and also his adherence to a narrative structure that almost seems deliberate in its efforts to throw the viewer off course. In terms of chronology, the first ten minutes are much more muddled and meandering than they really need to be but thankfully, things get much more sure-footed as the story progresses. It leads up to a final scene that is nearly note-perfect and gives Born To Be Blue a fitting denouement to Baker’s troubled and ultimately tragic legacy.